ORLANDO, Fla.–Immigrants, their brothers and sisters in labor and other progressive forces converged here on Oct. 29 for a protest demanding a path to citizenship for America’s 11 million undocumented immigrants and an end to the deportations that have torn apart tens of thousands of immigrant families. The action culminated in the arrest of 15 activists for nonviolently blocking an intersection. The protestors want GOP House Speaker John Boehner and tea party-backed Republican Reps. Tom Rooney, Dennis Ross and Daniel Webster, all of Florida, to “clear the path” and allow a vote before year’s end on comprehensive immigration reform. 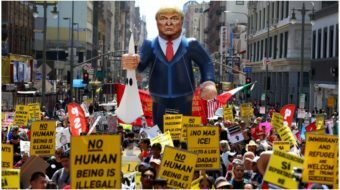 The protestors also want President Obama to halt the deportations of undocumented immigrants, which have soared to almost 400,000 annually during his administration. “We are here to say that there are no more excuses–we need immigration reform and we need a stop to the separation of our families,” Maria Rodriguez, executive director of the Florida Immigrant Coalition, told the 300 participants. “I’m here because I think it’s a human rights issue,” said Harriet Heywood, a moveon.org member from Homosassa, Fla.
Rivera was born in Colombia but has lived in Florida since she was three when her family came on a tourist visa and stayed because of concerns about violence in their homeland. Rivera’s mother was deported six years ago as the result of a traffic stop. “We’re asking for the human right to be able to stay together with our families,” said Lucas DaSilva, of United We Dream. 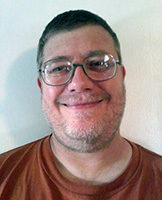 DaSilva was born in Brazil and has been here since he was a year old. His father was deported five years ago, and later passed away without ever being reunited with his son. Labor and farmworker groups participating in the march included Central Florida Jobs With Justice, Unite Here, Service Employees International Union, the Central Florida AFL-CIO Central Labor Council, Centro Campesino and the Farmworker Association of Florida. “Every time a boss separates workers based on the color of their skin, what language they speak, where they were born, the boss wins,” said Eric Clinton, president of Unite Here Local 362 and of the Central Labor Council. Once there, they filled all four street corners while a table was moved to the intersection and laden with Florida squash, pumpkins, eggplant and tomatoes to symbolize the important role that immigrant labor plays in Florida’s agricultural sector. Following this, the 15 activists, clad in red T-shirts emblazoned with “Clear Our Path To Citizenship,” sat down in the intersection and formed a circle. They linked hands to await their arrests, which began about 30 minutes later. As each one was placed in a police vehicle, the protestors chanted “We are proud of you” or “No estan solos” (“You are not alone”) and cheered. 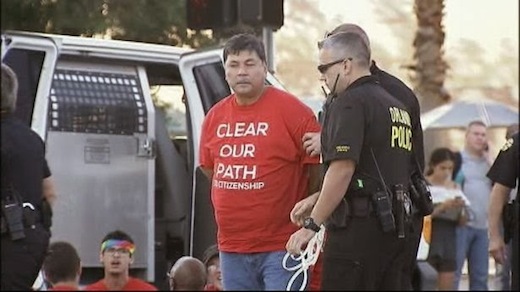 Those arrested included Tirso Moreno, general coordinator of the Farmworker Association of Florida; Jeremy Cruz-Haicken, president of Unite Here Local 737, which represents Central Florida hospitality workers; and individuals affiliated with SEIU, Dream Defenders and the Florida Immigrant Coalition. A candlelight vigil for those arrested was held outside the Orange County jail while their friends and comrades awaited their release. Other groups participating in the march included Mi Familia Vota, PICO Florida, Dreamer’s Moms, the Alliance for Citizenship, Fair Immigration Reform Movement, Cambio, Advancement Project, Get Equal, the Florida Immigrant Youth Network and Students Working for Equal Rights.